Home renovations are a necessary process when you own your home. Sooner or later you will want or need to remodel your bathroom or your kitchen or perhaps finish off that basement. Not only will renovations provide pleasure and function to you, but they could increase the sale value of your home a bit. Here are a few tips on saving money while doing renovations. Know what you want to do and plan it out well ahead of time. Want to redo your kitchen? Take time to shop around to figure out what exactly you want done. Do you really need new cabinets or could you just replace the doors? Do you need to replace the doors or would a fresh coat of paint suit you? If you are remodeling your bathroom, do you need to replace the vanity or would it look great with a refresh? When I redid ours, I used that spray meant to re enamel tubs to re-finish the vanity tops. I sanded and re-stained the wood cabinet and fashioned a matching frame for the mirror out of molding strips from Lowes that I got for about $3 each. Take the time to learn any requisite skills, either by reading, learning online or perhaps attending some of the home improvement big box store presentations and skill shops. Understand what parts of the job may require code inspections and what the codes mean. Save over time to build the funds you will need for the renovations you want. You really can wait on most things – but do act fast on those items that will cause further damage if you don’t handle them. When I re-did our bath floors, I knew I wanted tile. My son had a tile cutter which he loaned to me. I scouted for tiles as I went to garage sales for other items and was lucky enough to find not only a big lot of beautiful travertine tiles, but also two very usable Kohler bath faucets – for which we bought one replacement part off the Kohler repair site. I found wood frames for my national park posters and a wildlife themed shower curtain at the local thrift stores. If you can’t (or won’t) do all of the labor yourself, use your network to find someone with the skills you need and figure out what you can do for them to get their services free or at least at a discount. I traded cookies for labor. My hubby pulled the toilet, sawed off the door frames and installed the faucets in exchange for some cookies and special dinners (I got the best of that deal!!). Years ago, when my spouse tore off the roof and re-shingled it, he traded a hunting trip to our farm for skilled services of a carpenter friend. An internet search for ‘barter services’ will yield multiple sites for your review. As you start your project, especially if you hire an installer or contractor to do the work, avoid being up sold while in their shop. Stick to the design you envisioned and the materials you planned. Don’t let your project suffer from scope creep! When we re-did our utility area, we wanted more pantry space – with some basic cabinets that coordinated with our existing ones in the kitchen. The contractor I ordered through did his best to sell me really high end cabinets – without success. Talk to people you know to find who they may have used for their work. Check with your barber, beautician, lawyer, accountant and most especially with any real estate agents you know. Join a local real estate investor’s club and attend some meetings to see who these guys use. You may not want to go with the installer at the local big box – especially as a first option. You can probably get someone better and less expensive with a bit of effort. You may not want to go with the big contractors with the huge yellow page ads and TV commercials. They probably use local guys anyway and you can find those yourself with a bit of time and research. Check out Angie’s list – which has a membership fee – to see what folks in your area are saying about various companies. Don’t forget to check out the company on the Better Business Bureau site to make sure there were no complaints. Get and check references, read all contracts and make sure you don’t pay everything up front. National park framed posters and wildlife themed shower curtain. 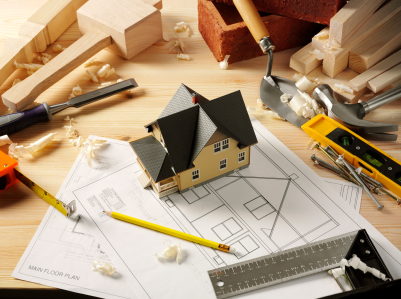 What have you done to get your home remodel projects done within budget? MoneyBeagle – I agree. I demoed the wallboard and tore up the carpet myself. Aside from that there wasn’t much destroyed on this bath project. I reused stuff instead. Having done some work recently, I think you got a steal thereby making a compelling case for your point. Planning is crucial and often not done or done haphazardly. I also agree that finding the right people to do the work can make or break a budget. Not being able to find the right people is one of the reasons I did the bath project myself. Wow, that’s a lot of value for $700. I put in a paver patio once for $700 (would have cost me a few thousand to have someone else do). Learning new home improvement skills makes this a worthwhile (and eco friendly) endeavor. I’m hoping to do a patio too, hubby and I are still in discussion about the upgrade costing more property taxes though! While there are certain home DIY projects that anyone can complete, there are others in which it’s best to bring in a professional. You don’t want to end up losing money because you have to pay to fix mistakes! That is very true. I don’t tackle electrical projects personally. that sounds like a good deal for all that work – i’ve heard a lot of people talk about angie’s list and may give it a try. Right now i’m in a rental and the owner gives me a discount if I fix things that break – I consider it a trial run for when I have my own home. We helped out our landlord way back when we rented too. This may sound strange, but I know there is a lot of building where I am… and anything tossed into the dumpsters is free. It’s amazing what you can find there that is simply excess on various job sites. I would be very careful in those situations. If the dumpsters are on private property, you can be considered both trespassing and stealing. Many construction companies have plans for scraps such as having them sorted for future projects and/or sale. There is a reason construction sites have fences bult around them and why people steal things like pipes and ac units–the parts can be stripped/melted down and sold for a nice little profit. and if you want to outsource it for any reason, lack of time etc, do price check at few places. Take opinion from friends who have done similar renovations. Very good tips Miss T! Wow $700 for a bath remodel- sounds very reasonable. I like your idea about trading cookies for labor lol, I’d say that’s a good trade off and return of investment if you ask me. Cookies for labor WAS a very good deal! Another thing you can do is repurpose old or broken items. It may not be as helpful for structural purposes, but for accents or trimming, it can work. That’s a good tip Eric. Have you done that yourself? Nice job on the bathroom…and great tips!